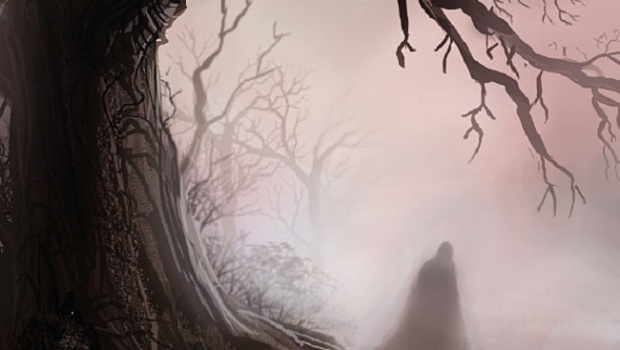 Containing a story that is shrouded in mist and mystery, the first volume of Top Cow’s Postal is released today. It collects the first 4 issues of the comic and forms the introductory arc to this very well crafted story. 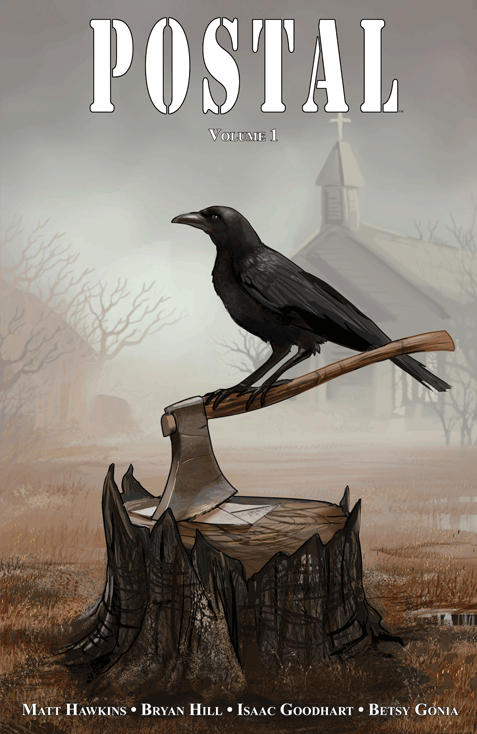 The town of Eden is an idyllic American suburb populated by ex-criminals and ne’re do wells. The township runs a healthy ‘no crime, no tolerance’ rule and holds the occasional religious sacrifice to remind the inhabitants just how good they have it, when they behave of course. Basically it’s Brookside* with more trees and more psychopaths. Well, one or two more psychopaths, but definitely more trees. The reader’s introduction to Eden is through a preachy sermon held on a dark night full of menace. The ending of which sees the bloodied reverend Nixon shove a gun into the face of a beaten man. From the very beginning you know not all is right in Eden. The rest of the story is centred on Mark who acts as the readers guide to the town and leads us through the narrative. Mark is the son of the Mayor, the town’s mailman and suffers from Asperger’s Syndrome. But despite his inability to empathise with the people he meets, he is the one character who takes an interest in the lives of the townsfolk; this obviously leads to bad days for Mark. Mark is inexplicably curious about red mud that he sees stuck to the wheels of Daniel Messersmith’s jeep. Daniel is a vile and ungrateful man and when Mark tracks him down to a shed in the woods surrounding the town, he doesn’t take kindly to being spied on. 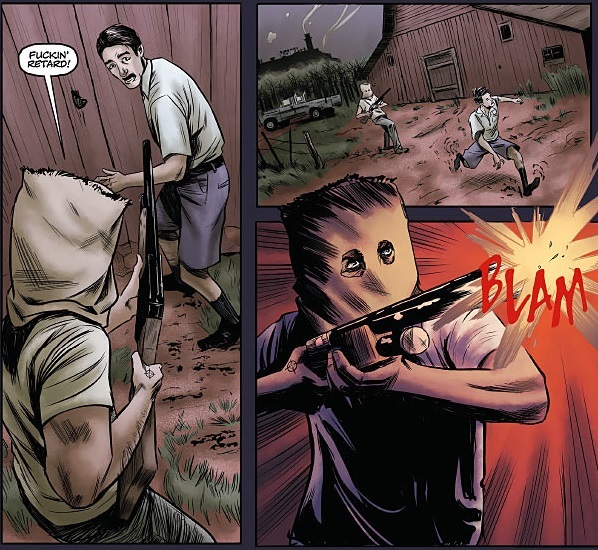 He sends Mark back to town with a shotgun wound to his side. Mark goes to Maggie first, a local waitress and the only person in town who seems to like Mark, before he visits his mother, the Mayor. Daniel has been running a drug factory and when Mark tells his mother, he knows what will happen to Daniel: remember the opening sermon? Well, the story leads back to that moment and the readers are shown what happens to people who break the law in Eden. However, this is not the shock ending to part one because outside the church is the body of a young woman, wrapped and left like a present for the town. From that moment onwards the story is full of twists and turns as Mark and Maggie investigate the mysterious body and everyone else’s indifference to it. The two M’s have to battle against people’s fear and institutional corruption to get to the heart of the matter but what they find there is more disturbing than either could have imagined. It is especially hard on Mark as everything revolves around his family: his mother present in the town and his father he believed had died years ago. The break neck speed at which the narrative flies through this first story arc is surprising but welcome. 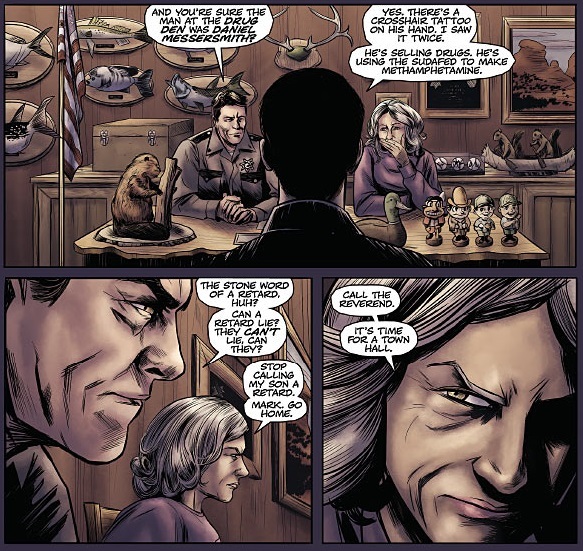 Matt Hawkins and Bryan Hill don’t get bogged down in building a long running mystery story, which could so easily have been the case with this story, instead they get straight to the point and keep the pace fast and exciting. The mysterious body at the end of part one is explained within part two; Maggie’s secret liaisons with FBI Agent Simpson is explained and used as part of the main story; the reveal about Mark’s father isn’t left to linger for a years’ worth of story, it is at the very heart of the first arc. Although not everything is resolved, it is a wonderful first arc crammed with character and plot developments. Mark is a lovable central character and from his introductory scene you empathise with him and his situation, even though he has trouble connecting with other people. His stilted, emotionless speech is contrasted against his inner monologue which is bristling with life and emotion. From the very beginning it makes his feelings for Maggie clear: another example of not hanging around, narratively speaking. Maggie is a brilliant character full of quiet, controlled strength. She’s the opposite of Mark and acts as his sounding board, protector and general partner in crime. Early on she is shown to have a rather sordid relationship as a spy for the FBI, the agent in charge of her takes advantage of the situation and treats her more like a prostitute than an informant, but Maggie quickly turns the table and gains the upper hand. “I like Eden” she tells Simpson, “I’d like to be more than just a waitress there. I’d like to be important.” And I have no doubt that she will become very important as the series goes on. There are a host of other interesting characters who populate the town, each with the potential for leading a story arc or two. By the end of the first arc it is clear that Mark and Maggie are the ones to watch but Hawkins and Hill are far from done with the likes of Sheriff Lafleur, ex-army and ex-pimp; or Dana, the Mayor and mother of Mark; or even the Native American Sampson, who lives out in the woods. It’s a rich tapestry of characters all linked by the sins of their past. The script is clever and cruel. Each of the characters has a distinctive voice which can be difficult to achieve especially so early in a comics run. Although most of the characters act in violent or cruel ways it is their speech that really develops them. At times the words they speak contradict their actions but are always portrayed as honest emotional responses to situations out of their control. Maggie is an especially well written character as she so easily could have become the ‘love interest’ but instead she is used as the single source of contact between Eden and the rest of the world. Whether this leads to anything remains to be seen but it cements her clearly as one of the central and important characters of the comic. Issac Goodheart’s rendering of the town and its inhabitants is detailed and appropriately dark. His attention to facial displays of emotion are important for the character development and without his ability to represent subtleties of emotion a lot of the character would be lost. There is also an element of realism to the work that doesn’t glorify any of the violence; when someone gets shot it hurts and this is made obvious and visible even when the people who are suffering probably deserve to suffer. Betsy Gonia’s colour adds depth to the realism and the intentionally muddy feel helps to create a sense of isolation that the town has. 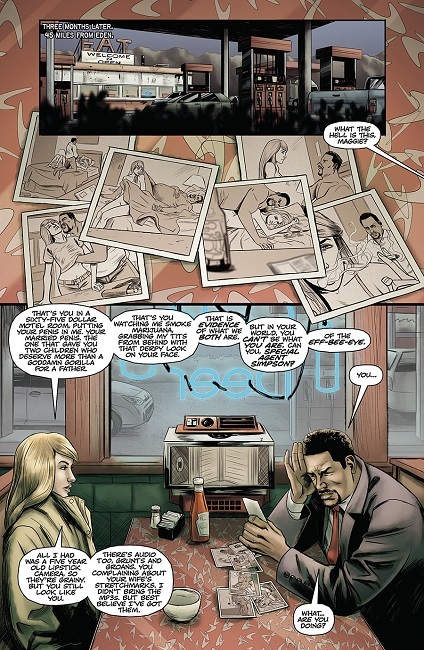 With the exception of Agent Simpson, himself as lost as the inhabitants of the town, the narrative exists in a bubble and this is emphasised by the brown and grey colour themes that run through the panels. It’s captivating and intriguing but doesn’t drag out the mysteries like some other comics have done, I’m referring to you Morning Glories, which is a welcome relief. It is a solid first act that introduces everyone you need to know in a story that feels complete enough to read on its own but open enough to feed into future arcs. This collected volume is definitely worth reading and if you get it now, you’ll be ready and waiting for the next issue when it is released in August. *For those not familiar with 1990’s British soap operas, Brookside was an urban shock fest passing itself off as an everyday, family drama series. It was most notable for its ‘bodies under the patio’ and ‘lesbian kiss before it was trendy’ storylines.